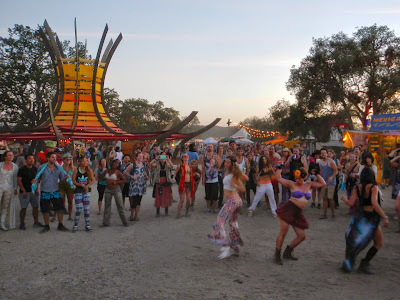 Last month I was lucky enough to go to Lightning In A Bottle for free with my friend Jason, thanks to KXSC. 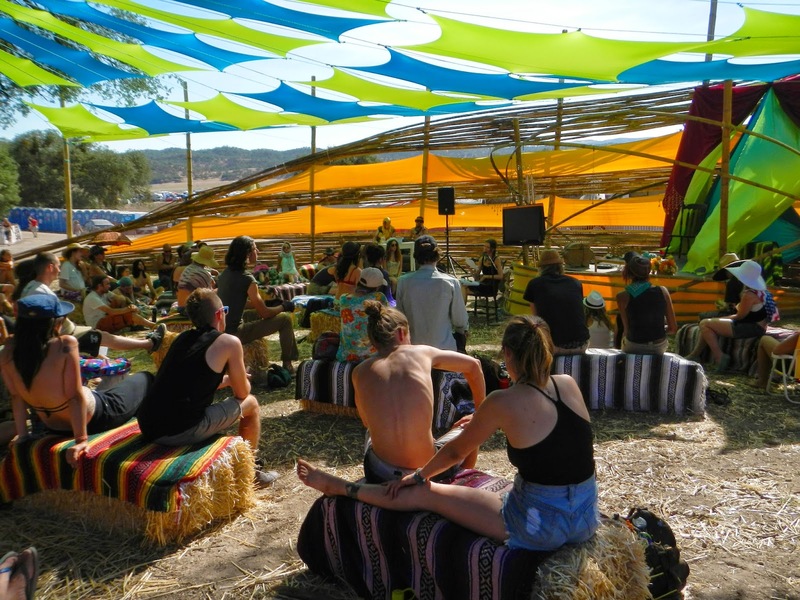 This amazing music, art and movement festival takes place in California, this year about half way between Los Angeles and San Francisco. Though I had never been, I had heard good things and was excited. Surprisingly, the fest exceeded all expectations. Tickets included free camping. I woke up every morning and went to a free yoga class. Then I spent all day going to inspiring talks and workshops under big oak trees on everything from permaculture to qigong to feminism to mandala drawing. 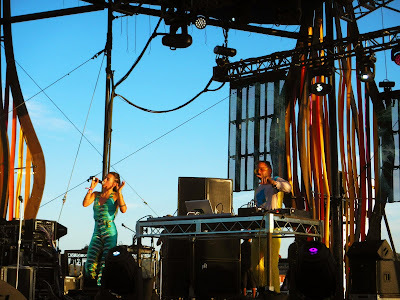 When things cooled off in the evenings, I wandered back and forth among the three main stages dancing the night away to the best up-and-coming electronica talents, as well as a couple established greats. 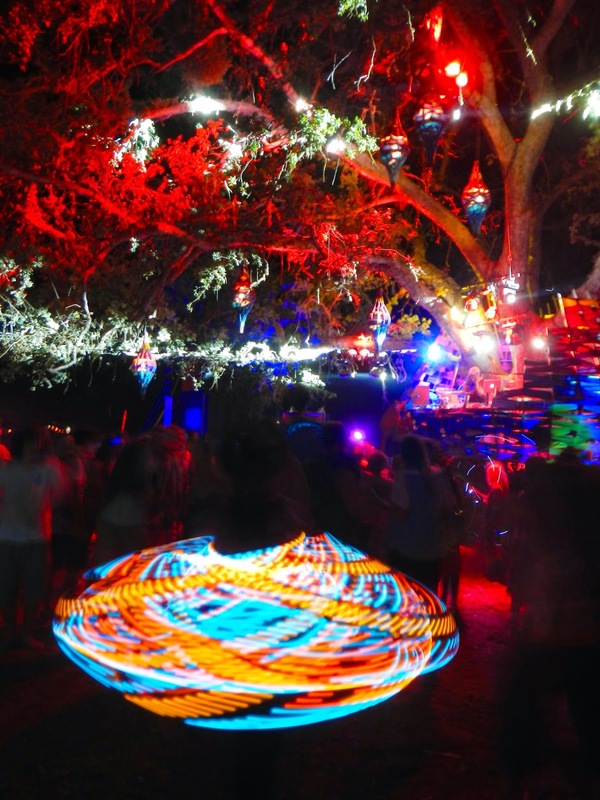 This comprehensive, and well-organized approach to producing a festival created a unique and palpable culture that touched all facets of the event and engendered a lot of positive vibes. It felt like only friendly, kind, fantastic people were in attendance. In short, I felt like it offered up the best of both Coachella and Burning Man with very few of the drawbacks. It was just what I needed, and I recommend it to everyone. I took over a hundred photos, but the few below give a good overview of the general scene. If you want to have a better idea of what it sounded like, you can stream my recap podcast here. 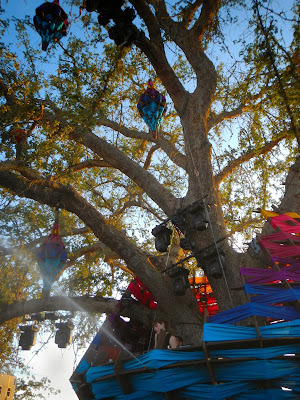 The Polish Ambassador kicked things off on the Lightning Stage Friday evening as the sun was setting. 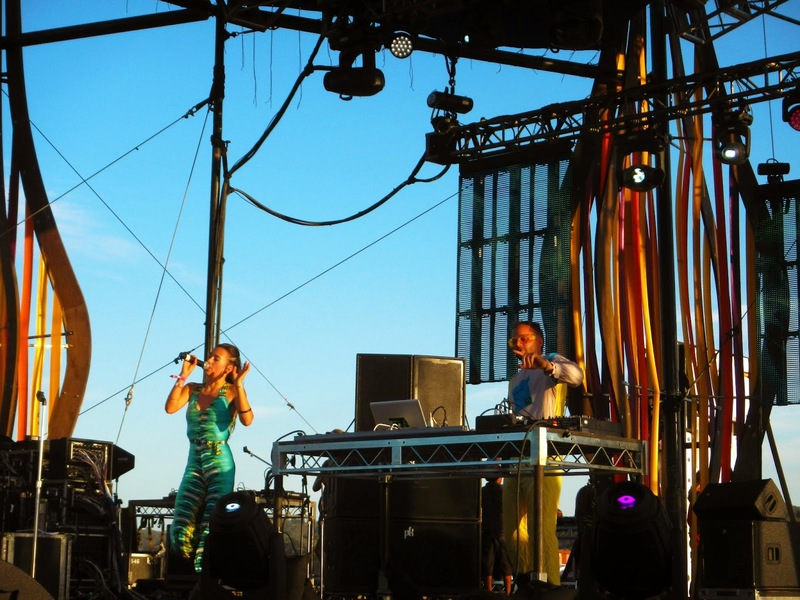 He brought on guest vocalists and dancers, and the crowd gathered quickly, streaming across the dusty fair grounds. On a hill overlooking the whole scene was Meditation Lookout. 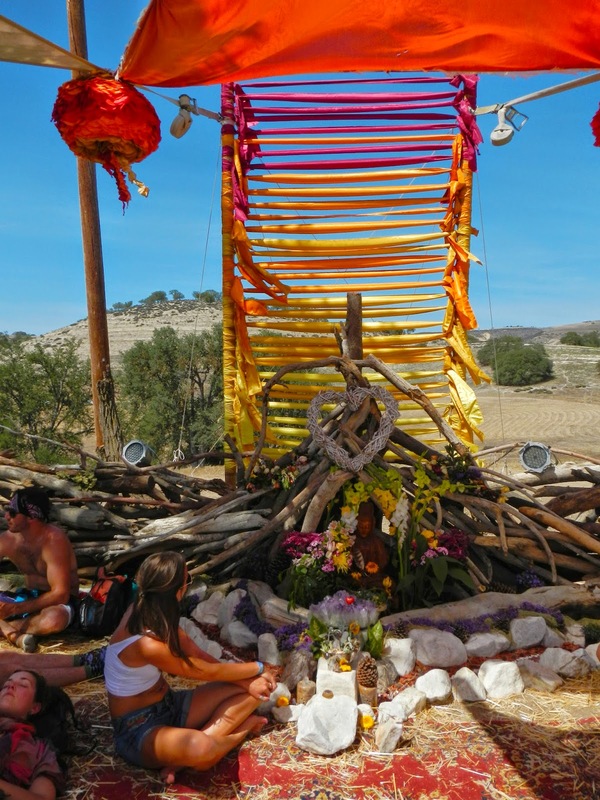 Beautifully constructed with many natural elements, the tiny temple offered a quite moment amongst the swirling activity of the fairgrounds. 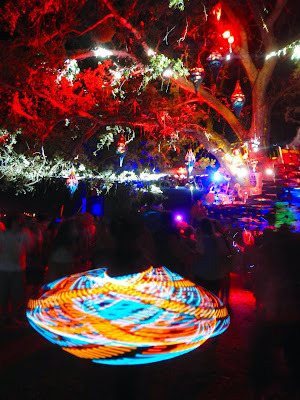 The Woogie Stage was by far my favorite, created by The Do Lab, this stage sits in a large tree like a brightly woven nest. Not only is this set up magical, it also somehow feels more intimate. 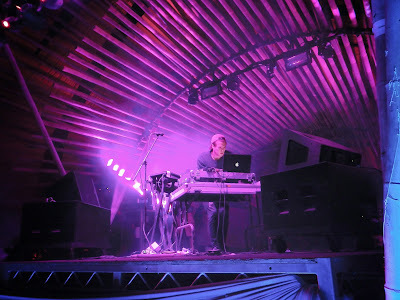 Here you can see J. Phlip djing an mind-blowing set. 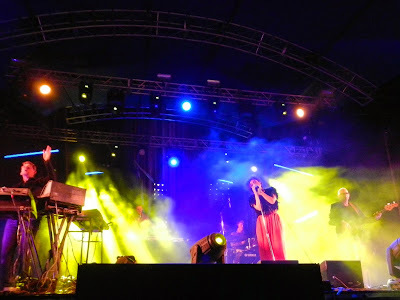 Of all the thoroughly enjoyable sets I saw at the festival, I think Kraak & Smaak might have been my favorite. They played the Lightning Stage Saturday night, and I was able to make my way front and center for an electric dance party. Sweater Beats played the Bamboo Stage, and drew a massive crowd despite playing early. He started out with mostly original material, and then transitioned to some innovative pop remixes. Juliana Birnbaum, co-author of Sustainable [R]evolution: Documenting The Permaculture Movement Worldwide, leads a workshop in the Mystery School about the permaculture movement and the journey that led to her book (which I bought). 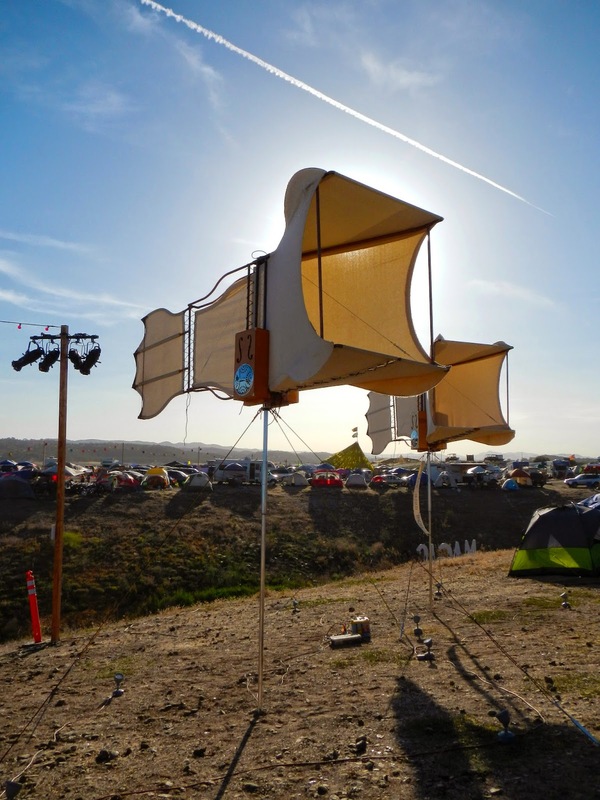 The campgrounds and fairgrounds were filled with random, and intriguing art installations, like the Raven Wind Harp, which looked like a cross between a Jules Verne invention and a resonator guitar. It looked and sounded lovely as pivoted softly in the breeze. 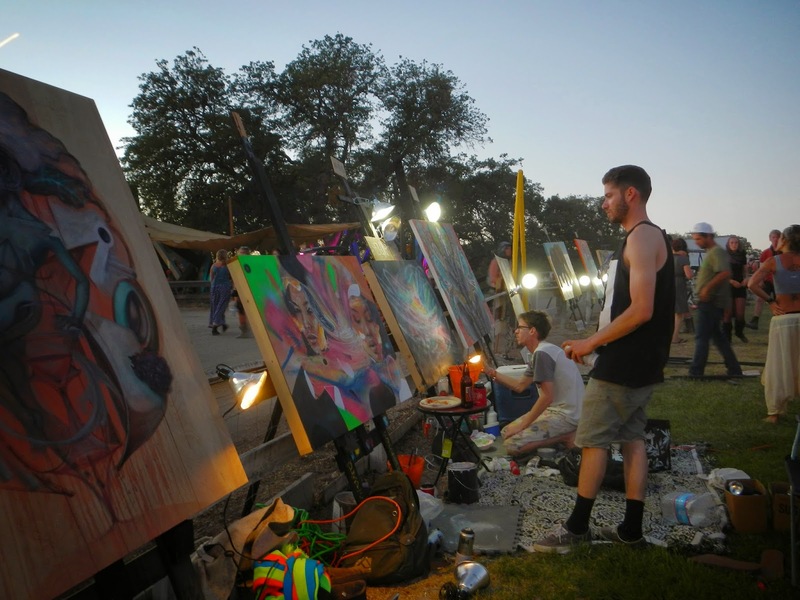 It would have been easy to stay entertained just wandering the several miles of campgrounds and fairgrounds, drinking everything in. 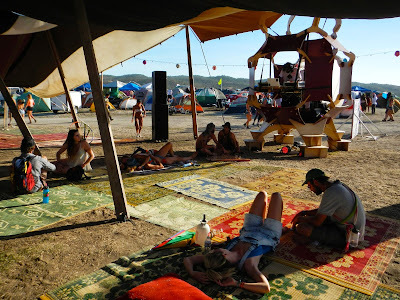 Many attendees had set up their own mini stages and entertainment areas that were active almost 24/7. 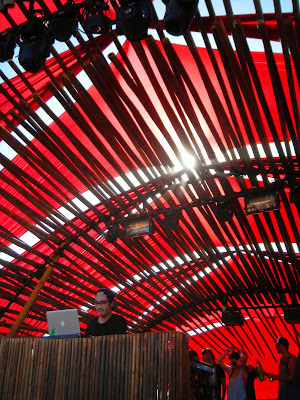 The Do LaB organized the festival, and also created the colorful installations that are so essential for creating this unique experience. 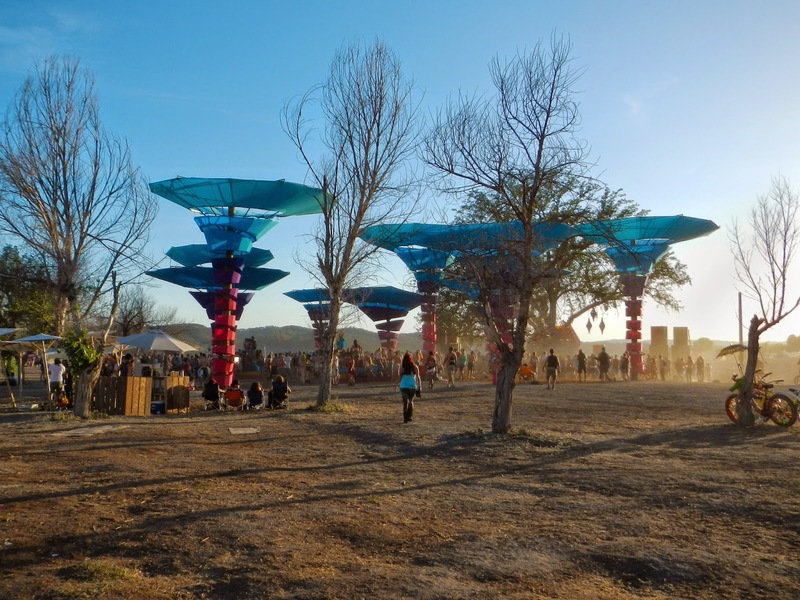 Here's the Woogie Stage from afar. Tourist played the Bamboo Stage Saturday night, and was fantastic. The crowd was thick and everyone was stomping their feet along to resounding and infectious beats. Artists in residence worked on original pieces throughout the weekend, and Sunday night there was a public, silent auction where you could bid on the art. All proceeds went to the Do ArT Foundation, which supports public art initiatives. You never know when a spontaneous, synchronized dance party might breakout in the market place!Be ready to participate in fun and movement at any time. 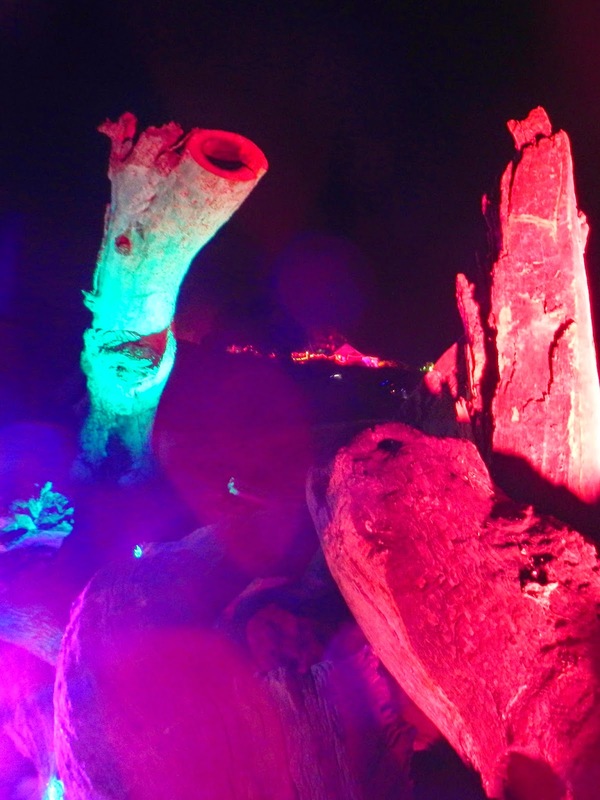 Found a random installation made with locally gathered wood scraps and lights at the bottom of a ravine in between the Woogie and Lightning stages. While I was resting and taking photos, a random guy showed up and started DJing, within minutes a small dance party was in full swing. 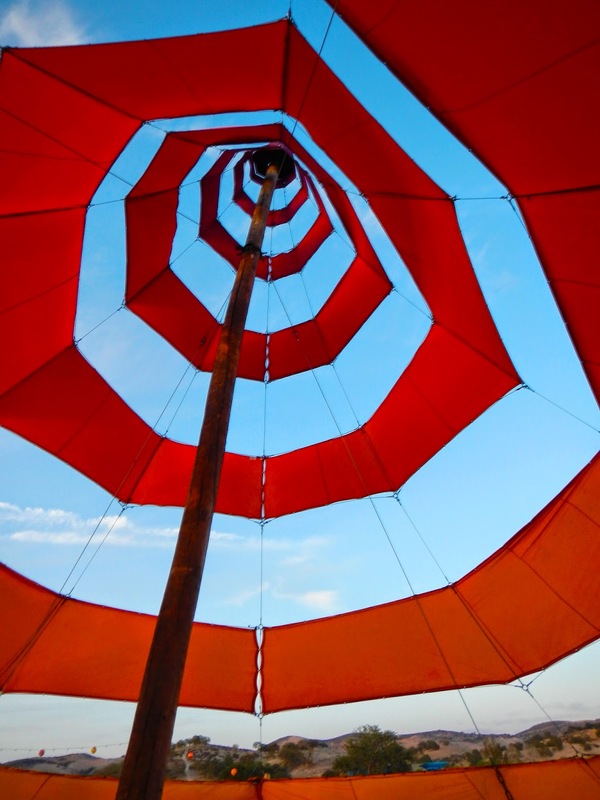 The view from underneath an iconic Do LaB installation: the spiraling tents that flanked the Lightning Stage.